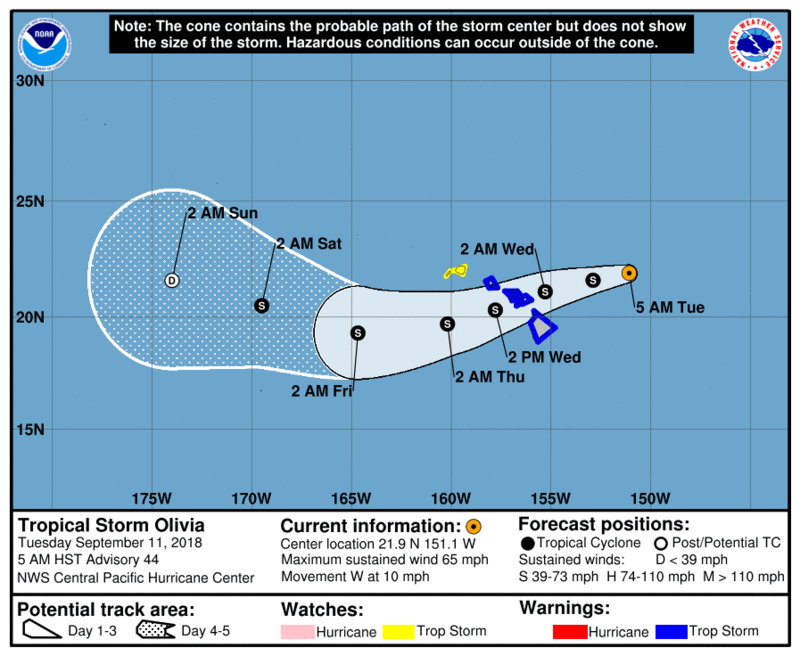 Olivia has begun a gradual weakening trend, but it is still forecast to move over the islands as a tropical storm as early as Tuesday night, meaning it could bring potentially damaging impacts to parts of the state. Hawaii News Now. Tropical Storm Olivia weakens slightly as it closes in on Hawaii. 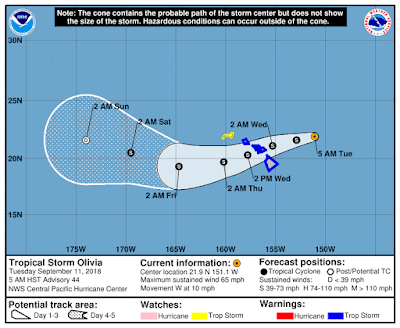 Located about 355 miles east-northeast of Kahului and 440 miles east of Honolulu, Olivia clocked in with maximum sustained winds of 65 mph and was headed west at 10 mph at 5 a.m. today, according to the Central Pacific Hurricane Center. Star-Advertiser. Hawaii Gears Up — Again — For Olivia. After the islands were mostly spared from Hurricane Lane’s wrath, leaders aim to keep residents on guard against a tropical storm. Civil Beat. What's closing or canceled as Olivia targets island chain. Hawaii News Now. Hurricane Olivia weakened to a tropical storm Monday as it advanced toward the Hawaiian islands but that didn’t stop the state’s visitor industry from unleashing a whirlwind of safety preparations. Star-Advertiser. The Federal Emergency Management Agency says that although they are stretched thin, they are ready to respond to all natural disasters. FEMA has been busy with multiple hurricanes threatening the United States, however agency officials got a head start since they were already activated in Hawaii for the past two disasters. KITV. Abigail Kawananakoa’s bid to regain control of her $215 million trust was blocked in court Monday by a judge who concluded the woman’s mental capacity is impaired due to the stroke she suffered last year. Star-Advertiser. Judge Appoints New Trustee For Kawananakoa Fortune. The judge ruled Abigail Kawananakoa can make simple decisions but not complex ones such as altering her 2001 trust. Civil Beat. Future of Health Care in the Pacific Uncertain As End to Compact Funding Nears. U.S. economic assistance under the Compact of Free Association is set to expire in five years – dealing quite a blow to the health care systems in three Pacific Island nations. Hawaii Public Radio. Why Brett Kavanaugh Scares Native Rights Advocates. Hawaii Sen. Mazie Hirono is just one of those who worries the Supreme Court nominee could upend hard-fought policy and funding gains. Civil Beat. ‘We Don’t Give Up’: Identifying America’s Long-Lost Soldiers. The POW/MIA forensic lab in Hawaii has more than 1,400 service members who have been missing in action, some for decades. Civil Beat. Unite Here Local 5 hotel workers voted Monday to authorize a strike at six Marriott-operated hotels in Honolulu and on Maui. Star-Advertiser. Hawaii hotel workers vote to authorize strike on Marriott. UNITE HERE Local 5 hotel workers from six Marriott-operated hotels in Honolulu and Maui have voted to authorize a strike with a 95% yes vote. KHON2. The votes are in and hotel workers have authorized a strike, these hotel workers work at six Marriott-operated hotels in Honolulu and Maui. KITV. Thousands Poised To Strike At Some Of Waikiki’s Biggest Hotels. The union vote could lead to a work stoppage by about 3,500 workers, including those at the Royal Hawaiian, Westin Moana Surfrider and Sheraton Waikiki. Civil Beat. World War II Valor in the Pacific National Monument to close Tuesday. Due to the tropical storm warning now in effect for Oahu, World War II Valor in the Pacific National Monument will close the Pearl Harbor Visitor Center at 2 p.m. on Tuesday, Sept. 11, to allow staff time to prepare for heavy winds and rain. KHON2. East Oahu residents worried about streams after April historic flooding. County crews are clearing out streams and ditches ahead of Olivia, Honolulu Mayor Kirk Caldwell said on Monday. Hawaii News Now. Fishermen feel vacating the ports ahead of a tropical storm could be dangerous. On Monday night, ports in Hawaii and Maui counties were expected to go into what's called condition "Zulu," meaning sustained gale force winds are expected within 12 hours. Hawaii News Now. Broken pipe causes cloudy, murky waters in Waikiki. The Department of Health is investigating a water main break at the Hale Koa Hotel. Hawaii News Now. First Circuit Judge Dean E. Ochiai ruled this morning to dismiss the last remaining motions in Star Beachboys court proceedings against the city and Dive Oahu, the city’s current operator of the Waikiki beachboy concessions. Star-Advertiser. Lawsuit alleges former Hawaii priest molested children. The lawsuit against the Diocese of Honolulu and Maryknoll Fathers and Brothers was filed today on behalf of a man who says a priest, James Jackson, abused him when he was a child in the 1980s. Associated Press. State and county officials advised residents to have 14 days worth of food and pet food, a full tank of gas and other emergency supplies ready as Tropical Storm Olivia is set to arrive either late tonight or early Wednesday. Tribune-Herald. Volcano House and Kilauea Military Camp work to reopen. Two attractions in Hawaii Volcanoes National Park are expected to be reopened to the public the same day the national park returns to service later this month. Tribune-Herald. Leilani Estates returnees assess lava damage. Star-Advertiser. Volcanic emissions down, West Hawaii skies clearest in years. West Hawaii Today. Students on Monday blessed with ti leaf and salt water the four corners of the site of a new creative arts, science and technology building at Waikoloa Elementary and Middle School in South Kohala. West Hawaii Today. Alleged threat briefly puts schools in lockdown. A suspect is in police custody after allegedly threatening gun violence Monday morning at the University of Hawaii at Hilo. Tribune-Herald. Algae biofuel company to launch commercial work. A company that set out 11 years ago to test whether it could make fuel oil from algae in Hawaii announced Friday that it is ceasing research work after succeeding, and will try to build a commercial production plant in the islands. Star-Advertiser. As Maui braces for the impacts associated with Tropical Storm Olivia, Maui Now is keeping track of what’s open and closed with an ongoing list of closures, cancellations and notices. Maui Now. Still scarred from Lane, Upcountry Maui braces for Tropical Storm Olivia. Maui County is staging resources island-wide, but both residents and emergency officials are keeping a close eye on areas still recovering from hurricane-turned-tropical-storm Lane. KHON2. Haleakala National Park to close ahead of Olivia. The National Park Service is closing Haleakala National Park ahead of Tropical Storm Olivia. KHON2. Ag program for keiki gets growing. Goals is to nurture a new crop of farmers by sowing seeds early. Maui News. Ledcor resort project on Maui more than half sold out. The Luana Garden Villas, Ledcor Group’s townhome project on 10 acres in the Honua Kai Resort & Spa on Maui, has sold out more than half of its 72 units since launching sales earlier this year. Pacific Business News. The County of Kauai will hold an open house and presentation on Wednesday to provide an update on the Lihue Town Core Mobility and Revitalization project. Garden Island. Immediate water conservation notice issued for Haena. he Department of Water issued an immediate water conservation notice at 6:25 p.m. Monday for all Haena customers until further notice, due to the recent damage to the hydrant and system in the area that has affected water tank levels. Garden Island. A disaster response team is planning a one-day rebuild on the North Shore. Garden Island.